Cold cases make the hottest drama! 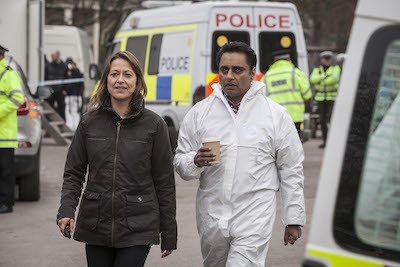 Two stone-cold cases of murder test the wits of crime-solving duo DCI Cassie Stuart and DS Sunny Khan, played by Nicola Walker (Last Tango in Halifax) and Sanjeev Bhaskar (Indian Summers), in back-to-back seasons of the critically acclaimed UK crime series Unforgotten, airing on MASTERPIECE, Sundays, April 8 through May 13 at 9pm on WOUB. Joining Walker and Bhaskar are Tom Courtenay (Little Dorrit), who won a best supporting actor BAFTA for his role in the series. Also appearing in Season 1 (Episodes 1–3 on MASTERPIECE) are Gemma Jones (Bridget Jones’s Diary), Trevor Eve (Death Comes to Pemberley), Cherie Lunghi (Mary Shelley’s Frankenstein), Bernard Hill (Wolf Hall), Hannah Gordon (Upstairs, Downstairs), and Ruth Sheen (Another Year). 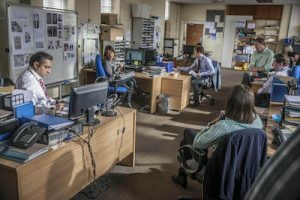 Guest stars in Season 2 (Episodes 4–6) include Badria Timimi (Syriana), Mark Bonnar (Line of Duty), Lorraine Ashbourne (Jane Eyre), and Rosie Cavaliero (Little Dorrit). Peter Egan (Downton Abbey) appears in both seasons as Cassie’s father. Season 1 opens (April 8) with a human skeleton found beneath a basement. The remains could be centuries old—or four decades, as comes to light upon further investigation of the crime scene. Cassie and Sunny eventually discover the victim was a young man, Jimmy Sullivan and his nearly-disintegrated pocket diary leads the detectives to a list of names that may hold the key to solving the murder. skinhead; and Eric Slater (Courtenay), an elderly, disabled bookkeeper taking care of his wife, Claire (Jones), who is suffering from dementia. They lead very different lives, but something links them, something that explains Jimmy’s final resting place and the torture marks found on his bones. Season 2 starts (April 29) innocently enough with a routine river dredging operation. When the scoop brings up a soggy, old suitcase, the workers open it and find a corpse sealed up so long that the tissues have turned to a soapy substance. Gruesome forensic work identifies the victim as David Walker, a businessman missing for twenty-five years. But Cassie and Sunny have other suspects to consider. A pager found with Walker’s remains leads them to Sara Mahmoud (Timimi), a Muslim teacher who wishes she’d never heard of David Walker. Other clues connect Walker with Colin Osborne (Bonnar), a gay attorney in the process of adopting a young girl with his partner; and Marion Kelsey (Cavaliero), a harried nurse in a children’s cancer ward. 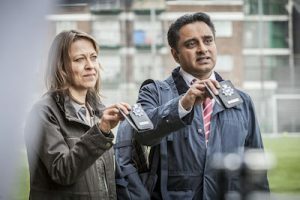 Unforgotten is a Mainstreet production for ITV. Chris Lang is the creator and writer. Andy Wilson is the director. The executive producers are Sally Haynes, Chris Lang and Laura Mackie. The producer is Tim Bradley. MASTERPIECE on PBS is presented by WGBH Boston.